Police in Gaza City on Monday stopped around 20 youngsters from holding a sit-in to call for unity on the bitterly divided Palestinian political scene. The demonstrators had been due to meet at the Square of the Unknown Soldier for a sit-down protest organised online through Facebook and Twitter, but were prevented from reaching the site by dozens of Hamas security forces, an AFP correspondent at the scene said. Police, some of them plainclothes forces carrying weapons, arrested at least one person, who protesters named as a leading organiser of the unity movement in Gaza, Ahmed Arar. “We came around 9.30 am (0730 GMT) with flags under the slogan ‘The people want to end the division,’” Hassan Farhat told AFP. Security sources did not immediately confirm the arrest, but a Hamas spokesman said the protest was broken up because the activists did not have a permit. “We reiterate our support for freedom of opinion and expression,” said Ihab Ghussein, a spokesman for the Hamas-run interior ministry. “What happened today was a gathering of no more than 10 people, who came without their identity cards and without informing the relevant authorities in the government as required by law,” he said. Thousands of young Palestinians have been joining groups on Facebook that call for an end to the bitter split between Gaza’s Hamas rulers and the Fatah movement, which dominates the West Bank-based Palestinian Authority. 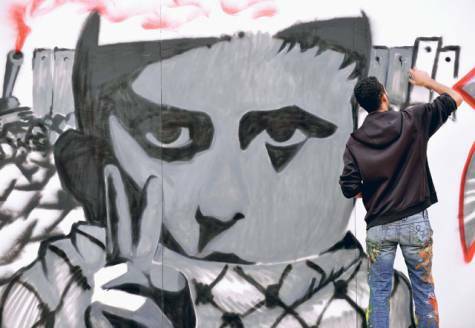 Young Palestinian activists, who have taken their inspiration from the protest movements sweeping the Arab and Muslim world, are trying to build up enough popular momentum to force the two factions to patch up their differences.